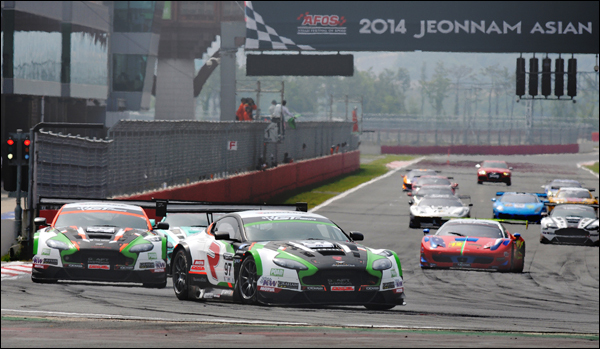 Round 1 of the GT Asia series saw the teams competing at the Korea international circuit in Yeongam. A track with a long back straight, fast sweeping corners and a tight twisty ‘stadium section’, a test for the many drivers getting used to their cars for the first time. With nine different marques in the GT3 class this is yet another championship benefitting from the popularity of the GT3 formula. Add to that another 9 season entrants in the GTM cup class for Supercup/challenge cars, the grid looks to be a very healthy one. Qualifying saw Andrea Caldarelli put his #5 Aston Martin Vantage GT3 on pole for Saturday’s race. The depth of the field was highlighted by the top three being from three different marques. 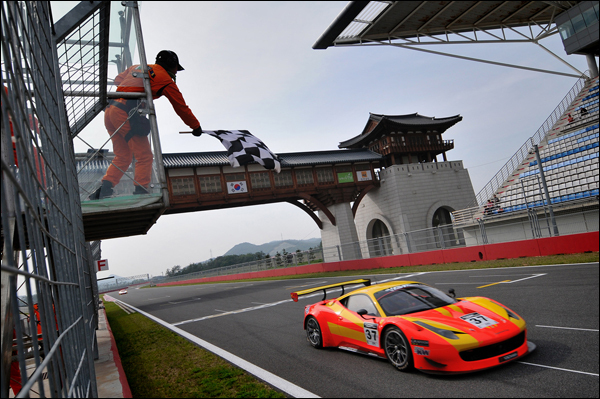 Behind Caldarelli came Keita Sawa in a Ferrari 458 and then 3rd was Rob Bell in his McLaren. Qualifying for the 2nd race on Sunday saw Rui Aguas post a time quick enough for pole in his Ferrari 458 followed by Anthony Liu in another Ferrari and the top three was rounded out by Hiroshi Hamaguchi who shares the McLaren with Rob Bell. 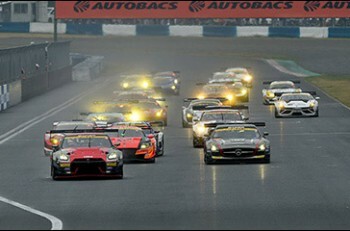 Race 1 saw a tight start with Sawa in his Ferrari initially getting the run on the pole sitting Aston Martin. 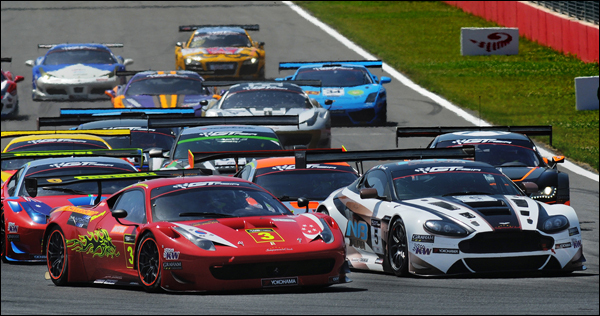 However before the end of the 2nd corner they had swapped positions a further 3 times and the Aston retook the lead. With the two leaders distracted by their battle Rob Bell couldn’t believe his luck and used the opportunity to take both of them and more importantly, take the lead. Bell later said “the leaders were so busy worrying about each other that I thought I’d sneak up the inside”. As the pit stop window opened, surprisingly the rapid Craig Baird in the #12 Ferrari 458 pitted first. It soon became apparent that all was not well with the Clearwater racing machine and Baird later explained that they had become stuck in 4th gear. Their lengthy stop put pay to any hopes of a top ten finish. With most cars starting with their Pro or more experienced drivers there was a frantic dash for the pit lane in the closing moments of the 10 minute pit window. 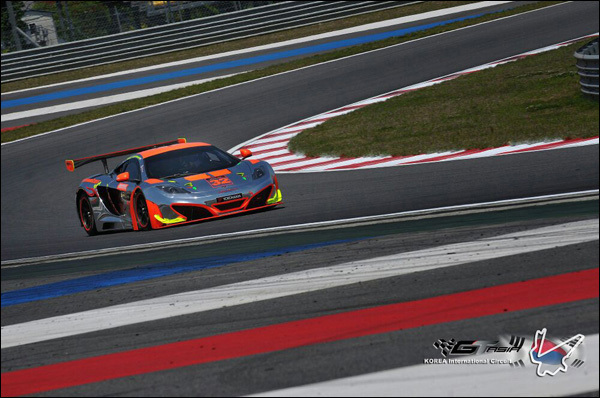 Bell in the #32 McLaren had only managed to pull out a couple of seconds lead over the impressive Caldarelli. So close was the battle for the lead that the McLaren and Aston Martin exited almost side by side very closely followed by both the #37 Ferrari in the hands of Anthony Liu and the first of the Craft Bamboo Aston Martin’s now in the hands of Frank Yu. Soon after the stops and with a four way battle for the lead the safety car was deployed as the #7 Absolute racing Audi had come to a holt with an apparent clutch failure. As the Audi was in a difficult to retrieve position the stewards had no choice but to deploy the safety car. Then sadly came the moment that Hamaguchi, who is sharing the McLaren with Bell, will want to forget. The safety car initially picked up a GTM car in front of the leading McLaren. However when the safety car waved the backmarker by Hamaguchi went with him. This meant that the whole field had to then stream by as the error was realised. By the time the field had re-formed back behind the safety car and they were ready to go there were just 9 minutes of racing to go. Yu did continue and now found himself in 3rd but with rear end body damage rubbing on his right rear tyre. Yu was now being hunted down by the fast charging Matt Solomon in one of the remaining Absolute Racing Audi R8 LMS ultras. 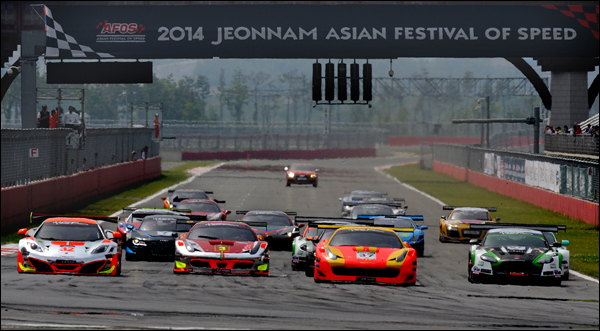 As the last lap began the McLaren of Hamaguchi and the Ferrari of Liu were nose to tail. The McLaren seeming to be able to able to keep the Ferrari at bay. 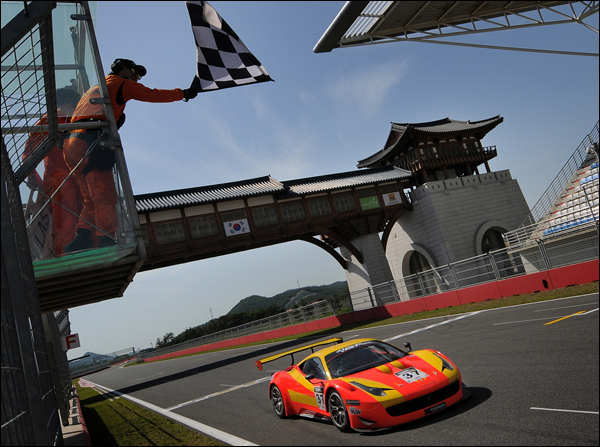 But then disaster struck three corners from the finish as Hamaguchi went into the 10th corner too hot and spun handing the victory to Liu and Rizzo in the BBT Team by (yes you guessed it) AF Corse Ferrari 458. A clearly devastated Hamaguchi recovered to cross the line 2nd with Yu in the #97 Aston Martin just holding off Solomon by less than a second. In GTM there was an absolutely remarkable result as former 500cc Honda Grand prix rider Takuma Aoki took part in his first major circuit race since a dreadful testing accident in 1998 had left him a paraplegic. Aoki, who was driving alone in his GTM class Lamborghini Gallardo, took advantage of a mistake in judgement by the then leading Ferrari of George Chou. Chou had seen Aoki’s team mate (a GT3 class Gallardo) in his mirrors and had slowed to let him by, only to see Aoki stream by too in the slip stream of his team mate. 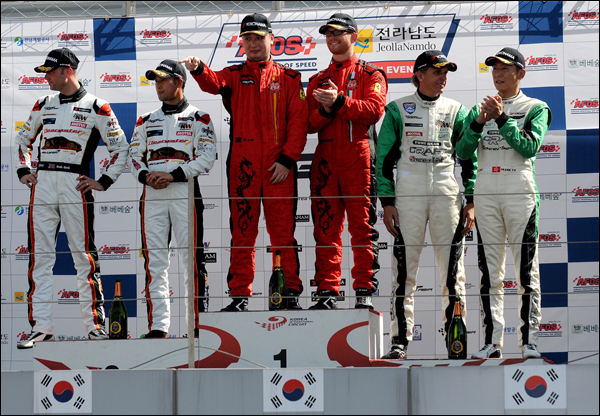 Aoki held on for the win which led to a very emotional podium. For race 2 the front row was a Spirit of Race team Ferrari lockout and streaming into the lead at the first corner was Saturday’s winner Liu. Liu was building a solid lead and composure regained Solomon was on the hunt for a top three going into the stops. First Solomon took Frank Yu in the Craft Bamboo Aston Martin and then rooted himself to the tail of Hamaguchi’s McLaren. Behind the top three were three Aston Martins. In fourth was Yu but he was closely followed by Natasha Seatter in the 2nd Craft Bamboo car and Jiang Xin in the NB team Aston Martin. The three swapped positions for lap after lap before Seatter found herself on a dirty line at breaking point and took a spin. Liu was one of the first to pit and handed over to the very capable Rizzo. Solomon, who had taken 2nd from the McLaren just before Hamaguchi had stopped was now lapping rapidly as he stayed out and took the lead. When he did pit and handed over to former F1 driver Alex Yoong they exited in the lead. The #98 Audi benefiting greatly from a rule that means the top three from race one are held in the pits for longer. Rizzo In the previous days winning Ferrari set about chasing down the leading Audi. The gap was coming down slowly but Yoong was able to put some rapid laps in on new rubber to respond and seemed to be odds on for the win. However heartbreak was just around the corner, Yoong was complaining that the car didn’t feel right and with just 15 minutes left on the clock pitted handing the lead to Rizzo in the Ferrari. It later turned out that the contact at the first corner had broken an upright, making Solomon’s early progress all the more impressive. The Audi wasn’t the only late casualty as the previous day’s pole sitter Andrea Caldarelli pulled his Aston Martin over with an apparent engine issue. “An engine failure in a Aston is rare, so we’ll go away and do some research before Autopolis and be ready to go again there.” Said Caldarelli of what was a very disappointing weekend for the team. GTM was a similar story to the first race, with Aoki taking the win but one he had to share as Dilantha Malagamuwa had demoted himself from the GT3 Lambo to Aoki’s GTM car when a broken 5th gear ring was found to be his lack of pace in Saturday’s race and a problem which they were unable to fix overnight. 2nd and 3rd were also identical cars as the previous afternoon with the #88 Taiwan Top Speed Racing Ferrari 2nd and the #77 Tiger Racing Team Audi in 3rd. So after a very competitive opening weekend Rizzo and Liu walk away with top points. But nothing about either race suggested they will dominate this season. Caldarelli in his Ferrari, Bell in the McLaren and the very impressive pairing of Solomon and Yoong in their Audi look very quick and the next round at Autopolis looks set to be a cracker. 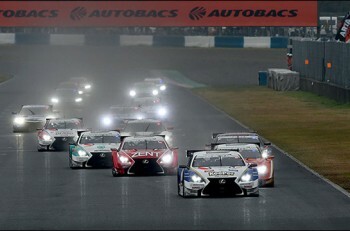 If that wasn’t enough for GT fans the cars share the bill with Super GT in Japan.